The national parks of Madhya Pradesh are a treasury of wildlife. The elusive deer runs for his life, the majestic tiger waits for his prey. The incredible wildlife is matched by the rustic landscape which weaves its magic on one and all. From the moment a visitor sets afoot in these parks, surprises await him in plenty. 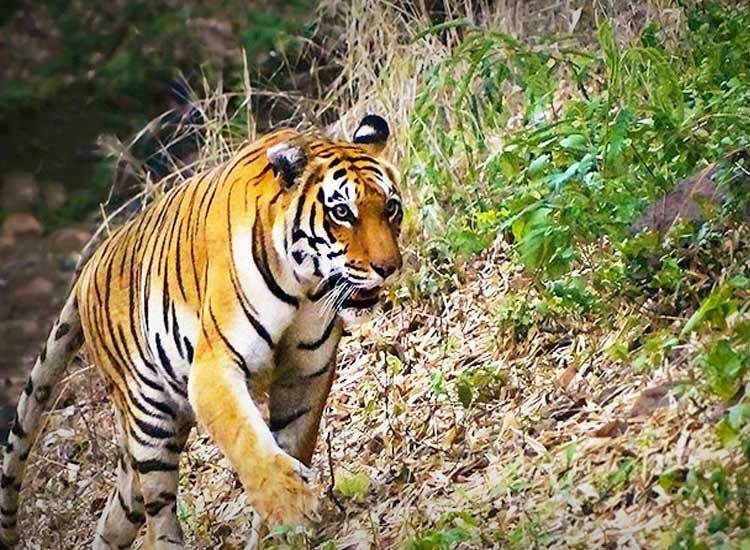 This blog brings you 7 Famous Wildlife sanctuaries and National Parks of Madhya Pradesh which are worth visiting. Bandhavgarh National Park – The tiger’s backyard! 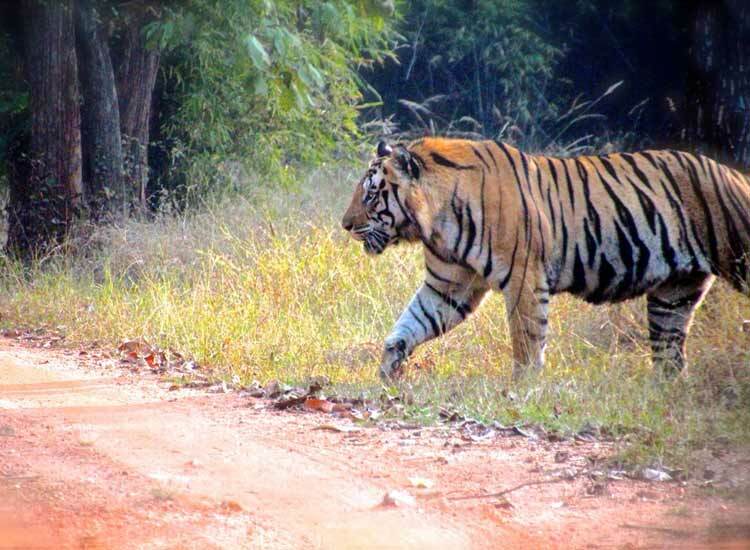 When you enter Bandhavgarh National Park, you enter the tiger’s territory! This park is eminent for hosting the highest density of Royal Bengal Tigers in the world. Here, you are able to view this magnificent beast at close range. A special attraction here is the white tiger. This park is home to about 37 species of mammals, 250 species of birds and around 80 species of butterflies. Apart from wildlife, this amazing park is also a place of historical and mythological significance. It traces its history back to 2000 years. It’s said that the Bandhavgarh Fort found here was a gift from Lord Rama to Lord Lakshmana. One can also finds various man-made caves with inscriptions and rock paintings here. There are a number of accommodations available near Bandhavgarh. Some of these are, Tree House Hideaway Bandhavgarh, Syna Tiger Resort, Kings Lodge Bandhavgarh and Jungle Mantra Bandhavgarh, beside others. Visit the 65ft long idol of Lord Vishnu placed horizontally on a seven-headed serpent at Shesh Shaiya. Wander the ruins of the 2000 years old Bandhavgarh Fort. Three Cave Point and Badi Gufa are some of the other places worth visiting. By air: The nearest airports are the Khajuraho Civil Aerodrome (250km) and the Jabalpur Airport (190km). Both are well connected to major cities like Delhi, Indore, Hyderabad and Mumbai. 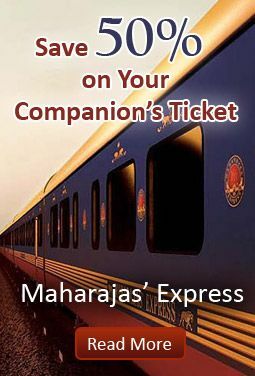 By train: The closest railway stations are Umaria (37km), Katni (100km), Jabalpur (190km) and Khajuraho (250km). These stations are well connected to major cities. 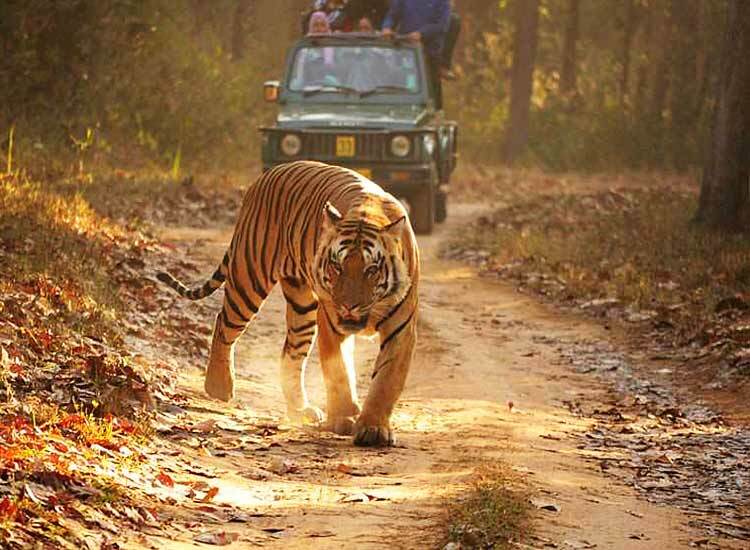 By road: You can reach Bandhavgarh by state or private transport buses from Umaria (37km), Jabalpur (190km), Katni (100km) or Khajuraho (250km). Pench National Park – Sher Khan awaits! You’ve seen the ferocious “Sher Khan” in movies and cartoons, right? At Pench National Park, you get to see the real “Sher Khan” in action. This is where humans come in close contact with exciting wildlife. No wonder, Rudyard Kipling chose this place as the background for Mowgli’s adventures. Located in the southern reaches of Satpura range, this park shelters over 285 resident and migratory birds. Besides, it has been a part of Project Tiger since 1992. Besides tigers, it’s also home to jackals and a significant number of leopards. One of the particular attractions of this wildlife sanctuary in Madhya Pradesh is “Collarwali.” In 2011, she gained nation-wide popularity when she gave birth to a litter of five cubs. Previously, she had given birth to a total of 22 cubs in six litters, setting an all-time record. Accommodations are available at Baghvan Hotel Pench, Tuli Tiger Corridor, Jungle Home Resort and Spa, Mriganaynee Green Resort, Tiger N Wood’s Resort and Mahua Vann. Spend some time at the Pench Reservoir. To spot the elusive leopard, head to Piyorthadi. Scenic views of the Pench River can be had from Sitaghat. By air: Sonegaon Airport, Nagpur is around 92km from the park. Nagpur airport, connected to Delhi, Mumbai and major cities, is also the closest airport. By train: Nagpur (92km) and Jabalpur (192km) are the nearest railway stations. Delhi-Chennai, Delhi-Bangalore and Delhi-Bilaspur trains halt at Nagpur. By road: NH 7 connects the Pench National Park to Nagpur. The drive time from Nagpur is 2 hours and from Jabalpur is 4 hours. Kanha National Park – Land of the tigers! 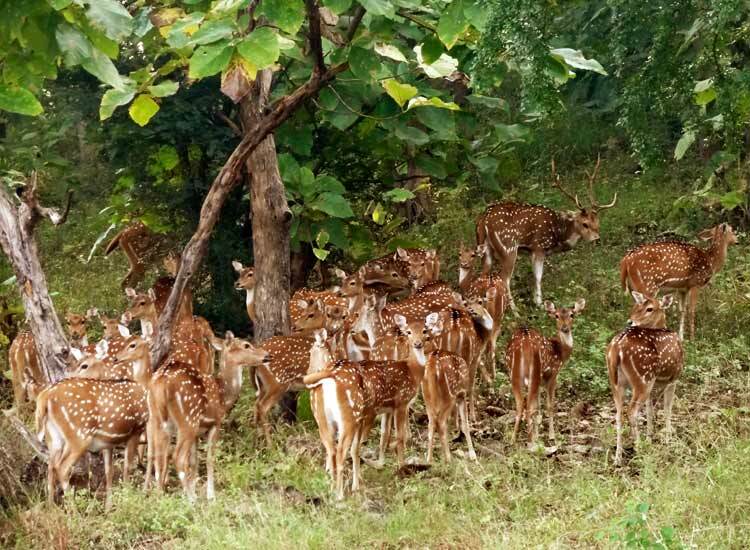 Sprawling across 940sq.km, Kanha National Park is undoubtdly one of the famous wildlife sanctuaries in Madhya Pradesh. Here, one finds the majestic Royal Bengal Tiger in abundance. Also known as Kanha Tiger Reserve, it’s acclaimed globally for saving the Barasingha from extinction. National Geographic shot its award-winning documentary show “Land of the Tigers” here. There are a range of accommodations available for the tourists. Some of these are Tuli Tiger Resort, Mogli Resort, Baghira Jungle resort and Krishna Jungle Resort. Head to the Sonf Meadows to view Barasinghas in great numbers. 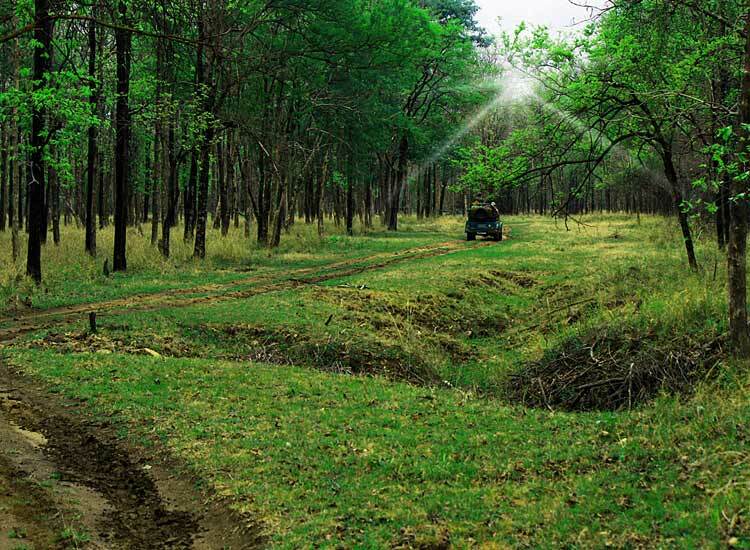 Another famous spot for tiger spotting is Kanha Meadows. Admire the beauty of the Sindoor trees found here. Visit the Kanha Museum for gaining an understanding about tribal culture. Spend some time by the shores of Shravan Tal, a lake possessing mythological significance. This lake is mentioned in Ramayana as the place where Shravan Kumar came to fill water for his parents. By air: The nearest airport, which is Jabalpur airport (170km), is well connected to all major cities. By train: The nearest railway stations are Bilaspur (175km), Gondia (127km), Jabalpur (214km), Nagpur (280km) and Raipur (216km). By road: The nearest cities are Jabalpur (165km), Raipur and Nagpur. Jabalpur and Nagpur are on NH 7 which connects Varanasi to Kanyakumari. 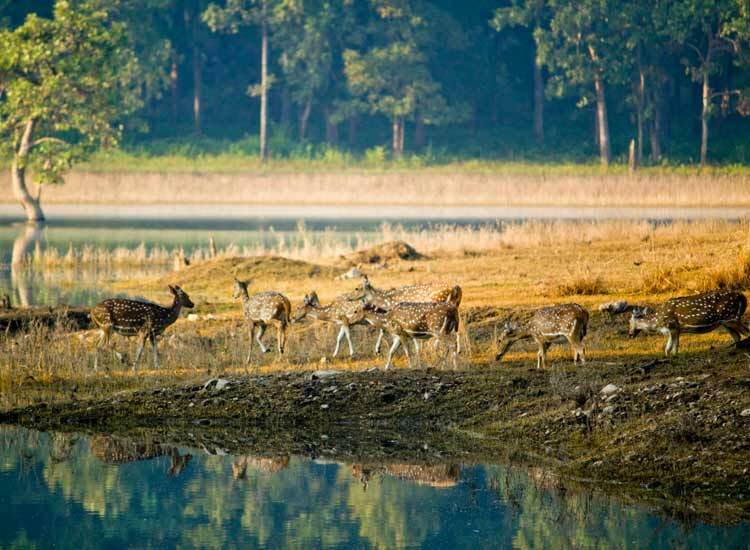 Madhav National Park – Natural Treasures! Madhav National Park once served as the hunting ground of Mughal emperors and Maratha royal families. This park endears itself to its visitors by its amazing lakes, as well as flora and fauna. It has been named after Madho Rao Scindia, the Maharaja of Gwalior. Undoubtedly, it’s one of the best places for spending a wildlife holiday in Madhya Pradesh. The dry and deciduous thorn forests are home to various antelopes like Nilgai, Deer and Chinkara. Sakhya and Madhav Sagar, the two lakes, support a rich variety of avifauna. One can spot birds like white-breasted kingfisher, purple sunbird, migratory geese oriole, etc. Visitors are captivated by sightings of various animals like tigers, hyena, sloth bear etc. One can find a range of accommodations here. These include Usha Kiran Palace, The A-Park Hotel and Clarks Inn Suites, Gwalior, among others. Visit the George Castle. Built in 1911, it offers amazing views of the lake. Enjoy boating at Sakhya Sagar Lake. Explore the various wood cabins and tree houses dotting this reserve. By air: The nearest airport is Gwalior which is 130 km away. Pre-paid taxi services are available from the airport to Madhav National Park. By train: The nearest railway station is Jhansi (100km). Jhansi is well-connected with major cities in India, including Delhi and Bombay. By road: State transport, as well as private buses, connect Madhav National Park to nearby cities of Gwalior, Indore, Bhopal, Jhansi, and Ujjain. Satpura National Park – Elephant safari beckons! Satpura, in local language, stands for “the seven mountains.” This park sprawls over an area of 1,427sq. km. Its rugged terrain and scenic landscapes endear it to visitors. 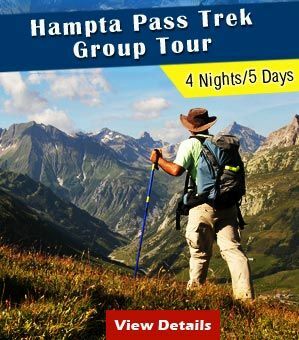 Narrow gorges, wonderful waterfalls, dense forests, sandstone peaks and fascinating valleys – it’s all here! It’s the abode of majestic tigers and several other critically endangered species. Taking an elephant safari is the best way of exploring this area. 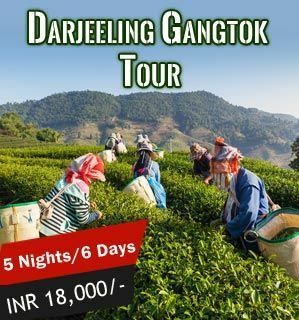 The thrilling bumpy ride takes you into the heart of the forest, besides tracking elusive tiger trails. One should visit this park during the months of November to March to watch rare migratory birds in action. Tourists can find a range of accommodations at Satpura National Park. 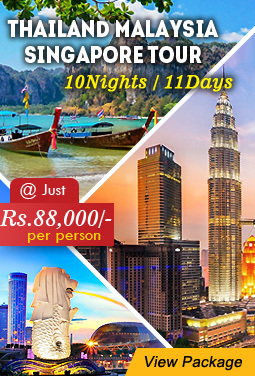 These include Reni Pani Jungle Lodge, Forsyth Lodge, Tawa Resort etc. 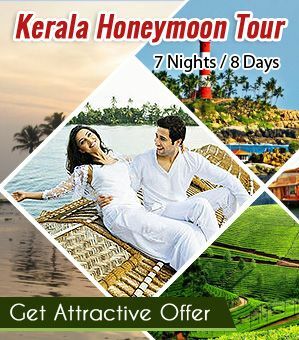 Take the Tawa Churna cruise and safari. Enjoy a motor cruise on the backwaters. Explore the raw wilderness and tranquility of Madhai, a reserved forest. By air: The nearest airport to Satpura National Park is Bhopal city (190km). It has direct flight connectivity with Delhi, Mumbai, Indore etc. By train: The nearest railway station to Satpura National Park is Sohagpur (20km). 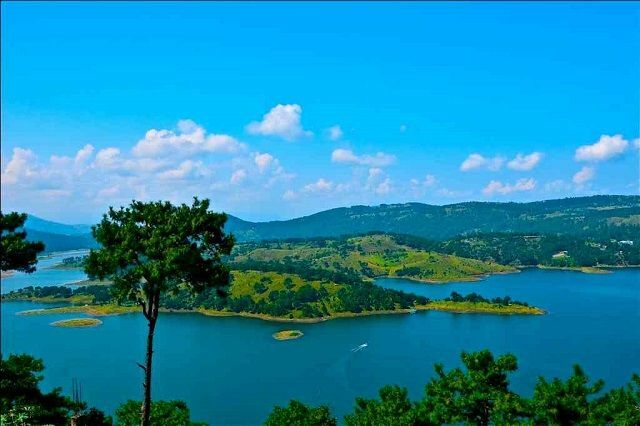 By road: Satpura National park, close to Pachmarhi hill station, is well-connected by road from cities like Bhopal, Jabalpur, Chindwara and Nagpur. Panna National Park – Mesmeric sights! Any wildlife tour in India would inevitably involve a visit to Panna National Park. This wonderful park is an oasis of tranquility, besides being incredibly picturesque. It is inhabited by more than 200 species of birds. Some of these are the hawk eagle, king vulture, honey buzzard etc. Besides various kinds of avian, Panna National Park is also home to an exciting wildlife. These include tigers, leopards, chitals, chinkaras, nilgais, sambhars and sloth bears, among others. Besides appreciating its flora and fauna, tourists also visit this place to marvel at the archaeological splendors. The Ken River, which flows through the jungle, hosts crocodiles, gharials and other interesting aquatic fauna. Tourists can choose from a variety of accommodations. 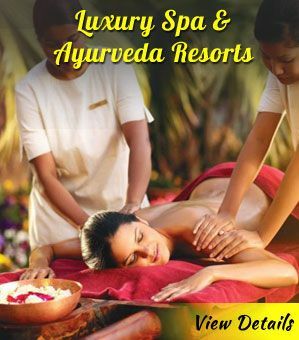 These are, Hotel Chandela, Hotel Ramada, The Lalit Temple and Hotel Clarks Khajuraho. Visit Pandava Falls and Caves, a place associated with mythology. 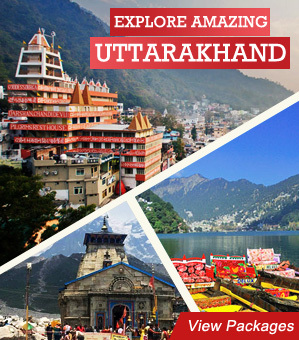 Visit the nearby temples like Jugal Kishoreji Temple, Baldeoji Temple, Mahamati Prannathji Temple etc. By air: The nearest airport is Khajuraho (27km). By train: The nearest railway station is Jhansi (176km). It enjoys connectivity to all major cities of India. By road: Located on NH 75, the park is well-connected to the nearby towns and cities like Jhansi. Van Vihar National Park – Inspiring biodiversity! Van Vihar National Park is one of the 7 Famous Parks of Madhya Pradesh. Located in the Bhopal district, it was declared a national park in 1979. Your wildlife holiday in Madhya Pradesh should involve a visit to this zoo. Luxury accommodations near the park are available for visitors. These are Hotel Lake View Ashok, Shyama Hills Bhopal, Sayaji Hotel Bhopal and Jehan Numa Palace Hotel. Explore the rich wildlife in the park. Admire the amazing flora surrounding the region. Visit nearby areas like Bhimbetka Rock Shelters, Sanchi Stupa etc. 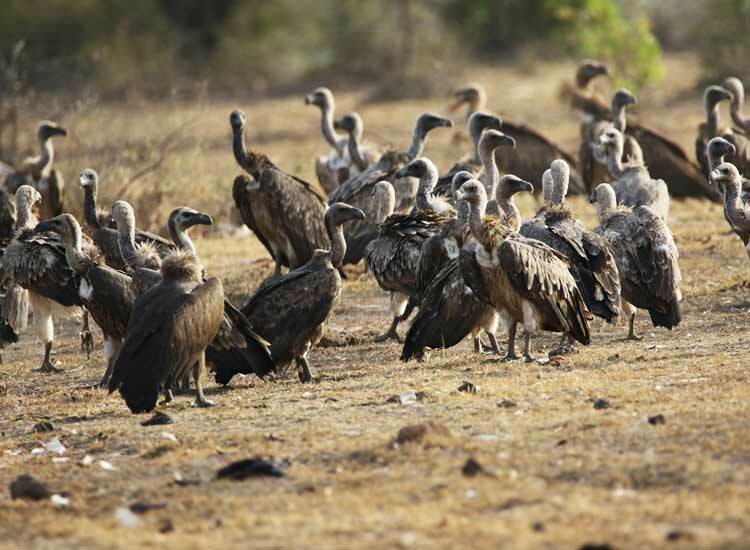 By air: The nearest airport to Van Vihar National Park is Bhopal airport (15km). It’s well connected by road to Van Vihar National Park. By train: The nearest railway station is Bhopal (6km). It is well connected by road to Van Vihar National Park. By road: This park is well connected to all the major cities road network. Plan your holiday in Madhya Pradesh with our customized packages, and discover the thrilling experience of India with Wildlife tour packages.